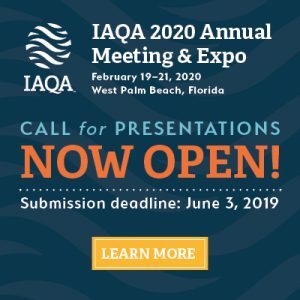 Share your expertise and grow your influence at IAQA’s 2020 Annual Meeting & Expo taking place February 19 – 21, 2020 in West Palm Beach, FL. Anyone with innovative ideas, trending research, or cutting-edge science in the following topic areas is invited to submit a presentation for consideration. IAQA focuses on engaging and educating industry professionals and the general public about indoor air quality.